Ron shows us how to use photographs in a creative manner, emphasising that they should not be slavishly copied. 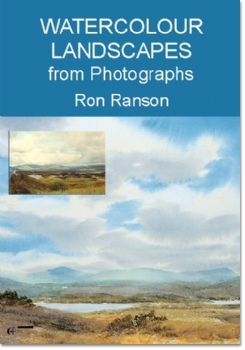 Using a selecttion of photographs as a guide, he paints a snow scene, a misty atmospheric creek, a river valley with bridge, a town centre and combines two separate photographs to produce one painting. Why is it that some artists totally dismiss the notion of working from photographs, regarding them as at best a last resort for reference material and at worst a process which is tantamount to downright cheating? There is no justifiable reason for this attitude, for, as Ron Ranson shows in his latest video, photographs can be a totally valid source of ideas, providing they are used wisely. In fact, photographs make very good starting points for paintings, with the artist adding some imagination and interpretation and changing the composition and colours as necessary. So, there is no need to copy photographs or to paint 'photographically'. 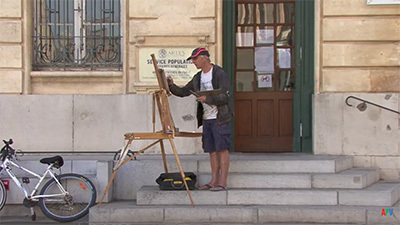 For various reasons it isn't always possible to make sketches on the spot, but photographs can prove equally useful. 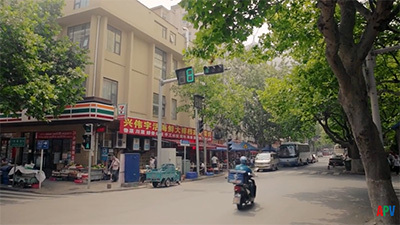 Ideally you should take your own photographs, bearing in mind how, both with regard to composition and specific subject matter and detail, they can inform ideas for paintings. And this is where Ron begins his film, out on location showing what to look for in suitable subjects and how to photograph them. 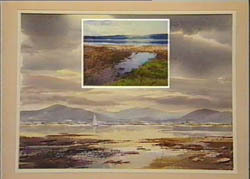 He tries a number of different viewpoints of a landscape scene, demonstrating how to create a composition that has impact and retains the viewer's interest within the picture boundaries. Where do we go from there? 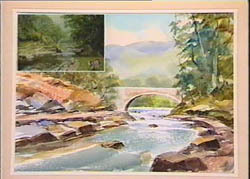 Ron's approach is to produce a tonal sketch from the photograph and then develop the painting from this sketch. 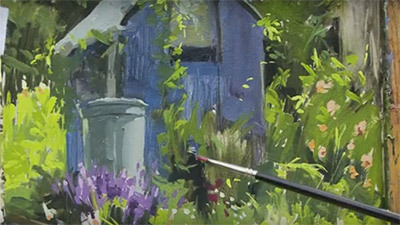 Back in the studio he shows how to make a quick tonal sketch to capture the essence of the idea and encourages us not to be afraid to modify what is in the photograph. 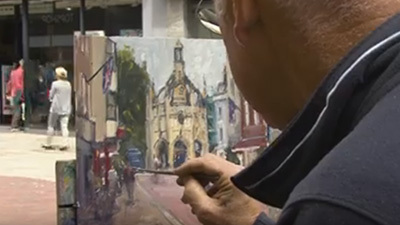 Now, working with just six colours and using his distinctive combination of broad brush and rigger techniques, he completes the actual painting. 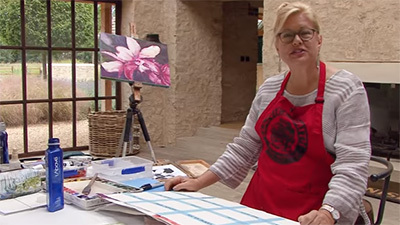 He then moves on to explore the potential of watercolour landscapes from photographs, selecting other prints from which to paint a snow scene, a misty atmospheric creek and an interesting group of buildings around Malmesbury Cross in Wiltshire. 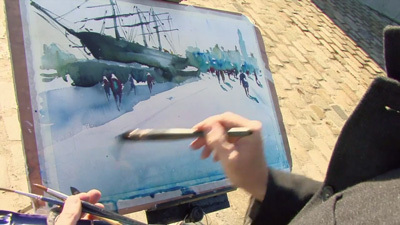 He also demonstrates how to combine ideas effectively from different photographs, painting an estuary scene in this way and a group of children playing on the beach. If you've had doubts about working from photographs or haven't been sure about the best way to use them, this video will give you all the confidence and information you need. 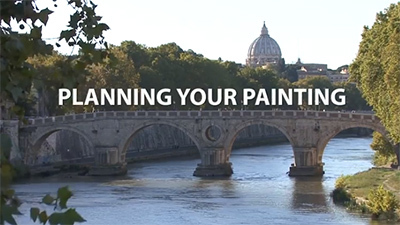 Quite apart from the specific advice and guidance apropos photographs, there are tips and techniques that will be helpful to all landscape painters.